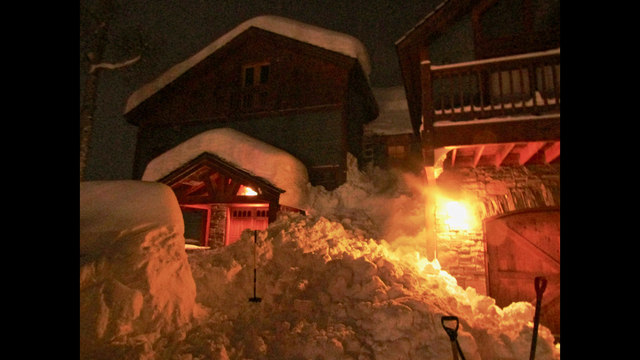 CRESTED BUTTE, Colo. - One person has been killed and two others were injured by deep snow cascading off roofs in southwestern Colorado. The incidents occurred Friday and Saturday in the resort town of Crested Butte, 125 miles southwest of Denver. Mount Crested Butte Police Department spokeswoman Marjorie Trautman says 25-year-old Stephan Michael Martel died and 37-year-old Blair Tulliver Burton was injured Saturday when snow slid off the roof of a commercial building. Trautman says they were reportedly clearing snow from the roof at the time. Trautman says 28-year-old Alex Theaker was injured Friday by snow sliding off the roof of a home. According to the Colorado Avalanche Information Center, Theaker, a property manager, was shoveling a client's sidewalk when he heard snow avalanche off the roof above. The shoveled sidewalk acted like a small terrain trap, burying Theaker under two or three feet of snow. When Theaker didn't arrive at a later appointment, his girlfriend checked on him, found the debris pile, and called 911. When the Crested Butte Fire Department excavated Theaker, he was unconscious and hypothermic. He had been buried for about two hours. First responders said his bent arm had created a basketball-sized airspace near his face. He was treated at the hospital and released the next day. Multiple avalanches have cascaded onto Colorado highways in the past week after heavy snows. The avalanche danger was moderate to considerable Monday.